** From 1998 through 2007, the team was named the " Devil Rays." * The Devil Rays began playing here in 1998. ** The original capacity was 45,200, but was reduced several times after 2002. BEEN THERE (NOT): I saw the unmistakeable white dome from an altitude of 40,000+ feet in February 2005. This was probably the most egregious example of a baseball stadium built "on speculation," and hopefully it will be the last. The original idea was to give the Chicago White Sox franchise a juicy package of incentives to relocate to sunny Florida, but Illinois politicians secured a financing deal to build a replacement for Comiskey Park just in the nick of time. Left out in the (figurative) cold, Tampa Bay area promoters then turned their attention to other restless teams, but those deals fell through as well. Tampa Bay missed out on the 1993 expansion round, but finally got lucky when MLB bestowed the franchise rights upon them in 1996. None of the other stadiums built on speculation had to wait as long as eight years before a major league team moved in. Under the original (1990) design, the outfield dimensions were perfectly symmetrical: 340 feet to each corner, 385 feet to the power alleys, and 410 to center field. By the time Tampa Bay was awarded a major league franchise in 1996, baseball stadium architecture had been revolutionized, and symmetrical domes were hopelessly out of style. So, they went to work trying to patch things up to conform to prevailing trends, putting angled fences in the corners, and turning the center field wall a few degrees clockwise. However, the resulting trivial asymmetry was all rather arbitrary and phony, much like the 2001 renovations in U.S. Cellular Field. According to the Rays' Web site, "Tropicana Field's asymmetrical outfield dimensions closely follow those of the Brooklyn Dodgers' old home; a fact that became evident only after those measurements had been determined." (How's that for absurd public relations hyperbole? In fact, none of the respective outfield dimensions are even remotely similar to Ebbets Field!) The distance from home plate to the backstop is only 50 feet, but there is a lot of foul territory down the lines, where fans can dine at tabletops in special areas next to the bullpens. A major part of the $85 million renovations prior to 1998 was the fancy cash-siphoning shopping mall through which many patrons enter the stadium. Open year round, it is known as "Center Field Street," and its signature feature is an eight-story-high rotunda entrance modeled after the one at Ebbets Field. Another addition was "The Beach" -- a small elevated deck with low-price seats overlooking left field. Behind the center field wall is the "Batter's Eye Restaurant" that features specially tinted windows. All those creature comforts are well and good, but no fancy bells or whistles or climate controls can hide the fact that indoor baseball is not real baseball. (One might question whether baseball even belongs in Florida during the summer, given the intense heat, humidity, and frequent tropical storms.) In a survey of major league players published in the July 7, 2003 issue of Sports Illustrated, Tropicana Field was rated as the fourth least favorite of all ballparks. There is one saving grace, however: It was judged to have the nicest visting team locker room. Tropicana Field is the first stadium with artificial turf to have an all-dirt infield playing area since Busch Stadium in 1976. 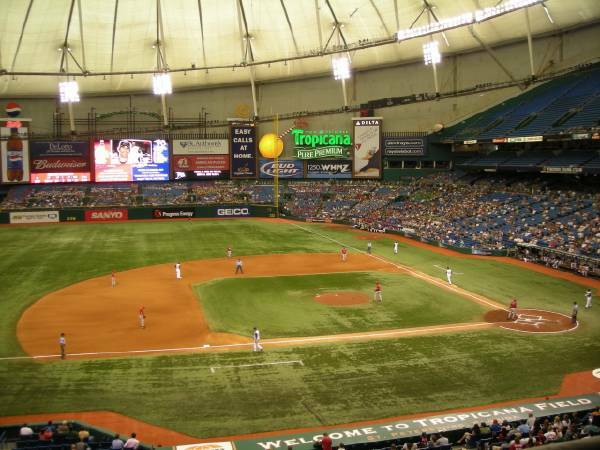 In 2000 a new surface (called "FieldTurf") was installed, giving Tropicana "Field" a more natural color and texture. It's like the "NeXturf" installed at Veterans Stadium in 2001. In 2007 (or thereabouts) a big new video display / billboard was installed in back of right field, causing a net loss of a few hundred seats. Prior to the 2014 season, they added a new walkway (called "Rays 360") around the entire lower deck, allowing fans to wander around without losing sight of action on the field. This entailed the removal of several hundred additional seats, as well as opening the restaurant in center field. For the first ten years, the Devil Rays spent most of the time at or near the bottom of the American League East Division. Frustration on the playing field was reflected in low sales at the ticket booth. In 2002 they became the first team to have lost 100 or more games in two consecutive years since the Blue Jays did so in 1977-1979. Average attendance in 2002 was about 13,000, the third lowest in the major leagues. In 2006 the owners spent several million dollars sprucing up the stadium, adding a unique feature in the gap on the right side of the center field restaurant: a large aquarium tank containing several live rays! (They are the relatively small and placid "Cow-Nosed rays," however, not exactly the fearsome undersea beasts one usually thinks about.) Then, in 2008 the team was renamed the "Rays," rather than "Devil Rays," and the result was immediate! They showed unexpected slugging power, led by veteran Carl Crawford, Carlos Peña, and rookie Evan Longoria, as well as solid pitching, and climbed to the top of their division. Against all odds, they hung on to first place through the rest of the season, and won the American League pennant for the first time. They lost to the Phillies four games to one in the World Series, however. The Rays have remained a postseason-contending team in most years, but attendance still lags. That is why are often mentioned as one of the "at risk" franchises, and relocation or "contraction" is not entirely out of the question. For two three-game series in May 2007 and April 2008, the Rays played "home" games at Champion Stadium (now called Disney's "Wide World of Sports") in Orlando, Florida. This was aimed at broadening the Rays' fan base in Florida, though some suspected subtle pressure on local governments to get a new baseball stadium built. See the Anomalous stadiums page. After a big push to get a new stadium built across the bay in Tampa, the Rays' owners resigned themselves to completing the full 30-year lease term in Tropicana Field, committing to improving the existing stadium. In January 2019 they announced that the entire upper deck would be closed, striving to create a more "intimate" baseball experience. This is the only major league baseball stadium ever to have served as a hockey arena on a regular basis. While the NHL Tampa Bay Lightning played here (1993-1996), it was named the "ThunderDome." The structure was renamed "Tropicana Field" in October 1996 under a contract with the Tropicana-Dole Corporation, a key part of the financial arrangements needed to upgrade the stadium prior to the inaugural 1998 season. The NCAA basketball championship "Final Four" games were played here in 1999, and the Arena Football League Tampa Bay Storm played here as well. In December 2008, the first annual "St. Petersburg Bowl" (later called the "Beef 'O' Brady's Bowl") football game was played there as well. The final such bowl game was in December 2017. #1 View of the diamond and right field from the middle deck on the 3rd base side. #2 Lower-level view of the grandstand from the right field foul pole. #3 Lower-level view of the outfield from the right field foul pole. #4 View from the west on the OUTSIDE, with bright blue skies and fluffy white clouds. All photos were taken July 19, 2007 in a game against the L.A. Angels, courtesy of John Minor.